Hi everyone. Tom and Dee are in God’s Country: AKA: Estes Park, Colorado. We lived here for something less than ten years – the longest we every lived in any community. It is one of the world’s testaments to God’s beautiful handiwork. We hope to take and post some pictures before we leave. They may appear here, but also on our Friends of Catholic Vitamins facebook page. We have remembered you in our prayers and, in a sense, have brought you with us. 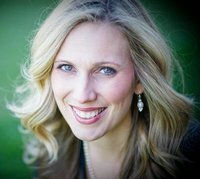 Our guest on this Catholic Vitamins show is Melanie Pritchard. And our Catholic Faith Vitamin for this show is H for HERALD. One of the definitions for herald is ‘to give tidings of, to announce, to proclaim, to publicize. This Catholic Vitamin is a focused reason why we reached out to Melanie to help us to meet her as a herald of life… of pro-life and modesty and feminine dignity and the love of God. (www.refugeclothing.com). In 2010, The Catholic Physicians Guild of Phoenix honored her with the “Evangelium Vitae Award.” In addition, in March 2007, the Phoenix Business Journal honored her with “The 40 Most Successful People Under 40 Award”. She has starred in two national commercials that promoted the value of life and the sanctity of marriage, has spoken on several radio stations, is a featured author in the book I Choose God, and has written her own book called, The Day I Died about her survival after suffering an amniotic fluid embolism. We hope you’ll listen to our podcast for this week — and please remember pro-life in your preparations for voting in November.